This was purchased for my grandson as a surprise when he came home from college during his break and he just loves it. He is very tall and is very comfortable sleeping in it. 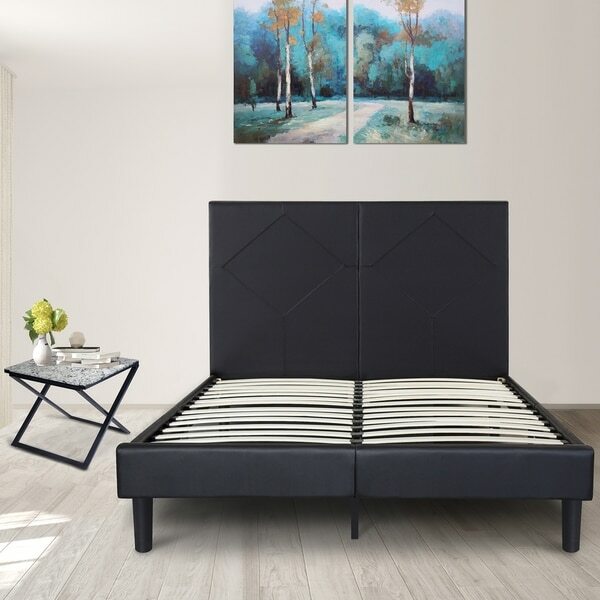 Sleeplanner 14-inch Dura Metal Bed Frame with Black Diamond Faux Leather Headboard - luxury header board with good cared faux leather is better than classic- this is designed to infuse new trendy style in your room and makes your room chic. Built with sturdy wooden slat and strong metal leg for extra center support, this platform bed frame does not need box spring. Very good & sturdy to hold my mattress evenly. Be warned that the box that it comes in is really heavy. Not too keen on the fact that the headboard is essentially 2 pieces hinged together but as for now, it's holding up well. Overall, really nice bed for the price. I recommend this bed for anyone on a budget who likes a clean sleek look for bedroom furniture. Great price and size frame. It’s not bulky which makes my room look bigger. Was a little worried about the slats but turns out they flex which makes the bed more comfortable. Love it! Very happy with this purchase. I was pleased with the sturdiness for the price. Shipped in one box which was pretty heavy. I recommend help if you need to move the box. Went together fairly easy in about an hour and a half, although I did have help with that. Looks just like the pictures. The bed looks nice. Came with missing bolts and screws. I purchased them from *** for less than *** rather than waiting for Overstock to send them. It was simple to put together. However, I have only had the bed for 3months and the steel legs broke. Looks like a bad wielding job. I purchased the 10 plan so hopefully everything goes smoothly. I weigh less than 200 pounds and all I do is sleep in it. Maybe I just got a bad bed frame. Although the bed serves the purpose for which it was intended, it came with a lot of small parts and took hours to put together. The bed is nice but some of the screws were missing. Excellent quality and easy assembly. Looks great in the room! "Will the wooden slats support a tempur pedic pillow top mattress, which is very heavy?"